Now fully revised and updated, the second edition of the Oxford Handbook of Paediatrics provides a compact guide to all aspects of acute and chronic paediatrics. The handbook's team of specialist contributors and editors have successfully condensed many years of clinical experience into a pocket-sized compendium of clinical problems and treatment options. Taking a child-centred approach to the subject, the authors have provided comprehensive coverage of areas such as neonatology, surgery, genetics and congenital malformations, and child protection in a user-friendly and succinct style. Sections are also devoted to covering the treatment of children in the community, and the psychological effects of illness on both the child and their family. With practical advice and space for personalized notes, this handbook will be invaluable to all those involved in the care of the younger patient. Severely unwell children are the most frightening emergency a clinician can face. 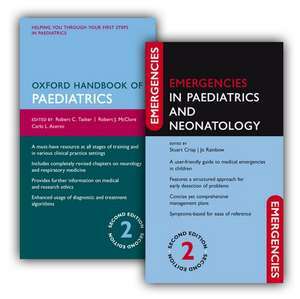 Emergencies in Paediatrics and Neonatology aims to guide the clinician through what to do and when; in a format that can be read at the bedside. Resuscitation techniques are described in detail and comprehensive management plans are provided. Emergencies in Paediatrics and Neonatology second edition is a symptom-based handbook which concisely covers a range of essential information, from the key facts to elicit in the history to the specific difficulties of children in an emergency situation - communication and pain relief. Symbols are used to indicate clinical severity ranging from life-threatening to minor, and the book includes detailed drug dosages for children and the most recent resuscitation guidelines. The new edition brings this bestselling guide fully up-to-date including the management of anaphylaxis and rheumatic fever. The number of algorithms included in the book has also been increased. Dr Jo Rainbow Graduated from Oxford 1993; trained in Paediatrics at John Radcliffe, Oxford until 1997. Decided to have a year in Australia to recover from the MRCP and never returned. Subspecialty training in Paediatric Emergency at Children's Hospital at Westmead and Sydney Children's Hospital - the major paediatric trauma centres for Sydney; and tertiary paediatric hospitals for NSW. Met husband whilst on secondment to Orange, a regional centre 3 hours 250km ofSydney. Now juggling motherhood, part-time work and a fluctuating golf handicap.